On September 18th, 2013, INAOE and WebCams de México commissioned two HD web cameras at the LMT site which will continuously broadcast images via the internet. On September 18th, 2013, INAOE and WebCams de México commissioned two HD web cameras at the LMT site which will continuously broadcast images via the internet. One of the cameras shows the LMT with the Popocatépetl (5,500 m), Iztaccíhuatl (5,286 m) and La Malinche (4,420 m) volcanoes on the background. 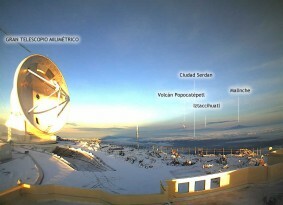 The second camera points towards the Pico de Orizaba volcano (5,610 m), and the gamma ray observatory HAWC may be seen eventually. Due to the high altitude of the LMT site (4,581 m) these are the second highest permanently installed web cameras in the world, operating 24 hr a day. The highest web cameras broadcast from Kala Patthar (12 hr a day, at 5,675 m) and the Khumbu Valley (5,079 m) near the Mount Everest Base Camp. The LMT and Pico de Orizaba images can be seen at the WebCams de México webpage.